I will start off by saying this is fabulous. It is so good, I have no words to describe it, although I’m a food blogger, so I guess I will have to try. I will be the first person to admit, that I never really wanted to roast a chicken before, I got my air fryer. I mean really, its’ just a regular piece of chicken, but whole, baked for an hour and it has some sort of flavoring on it. But, since my kids are eating a ton these days, I thought I would try my hand at making my 1st roasted chicken, in the air fryer. And, I shouldn’t have waited, my kids were literally grabbing the meat off the bones. All of the meat was moist and delicious, they loved the skin too, which is weird because they usually don’t eat the skin. This one had tons of flavor and had a great crispy flavoring. 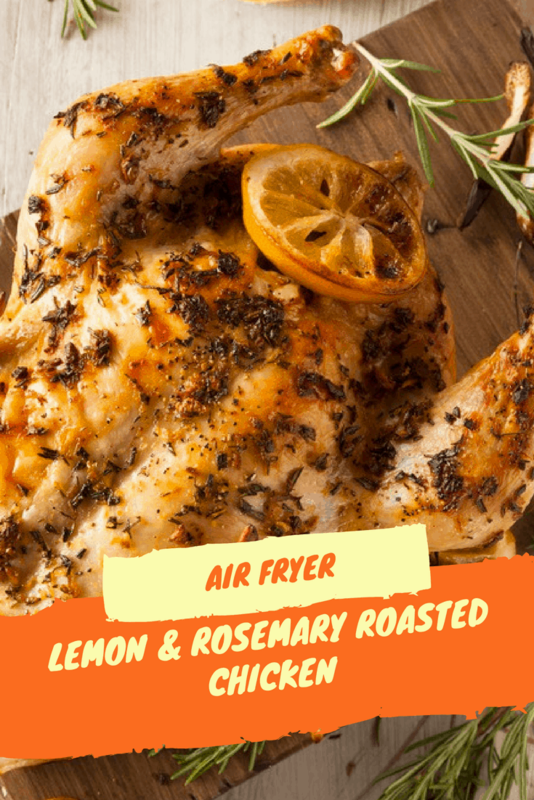 The size of the bird, that you can cook will depend on how large your air fryer is. I have a 5 quart one, and my chicken was just over 3 pounds, and it fit wonderfully. You can season the chicken with anything, today I went with a basic lemon and rosemary rub. because it would burn and cause havoc in my air fryer. 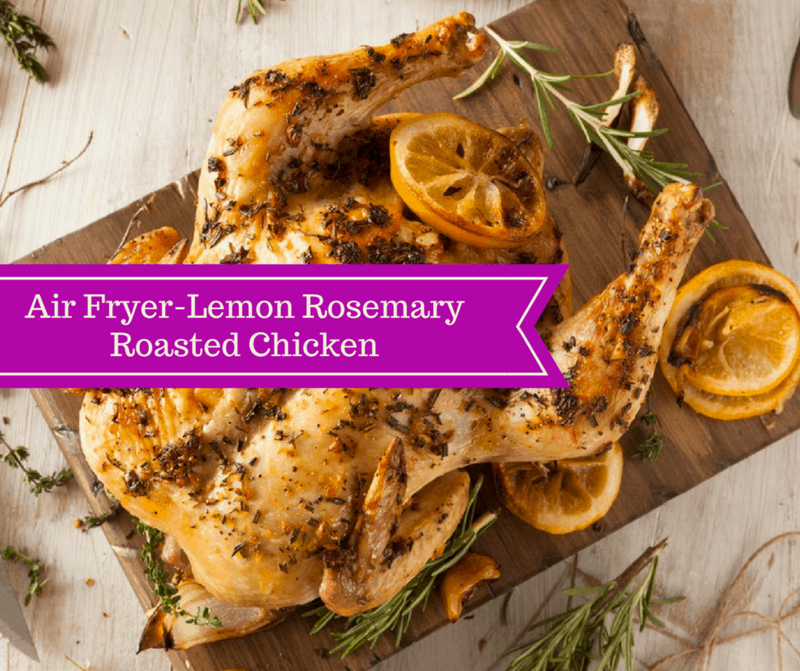 Start by cleaning the chicken, then rub the lemon over the chicken and sprinkles the rosemary over it. I placed the used lemons in the cavity of the chicken. Spray your chicken with olive oil sprayer, and set the temperature to 330 degrees F, for 30 minutes. After the 30 minutes are up, flip the chicken and air fry for another 20 minutes. 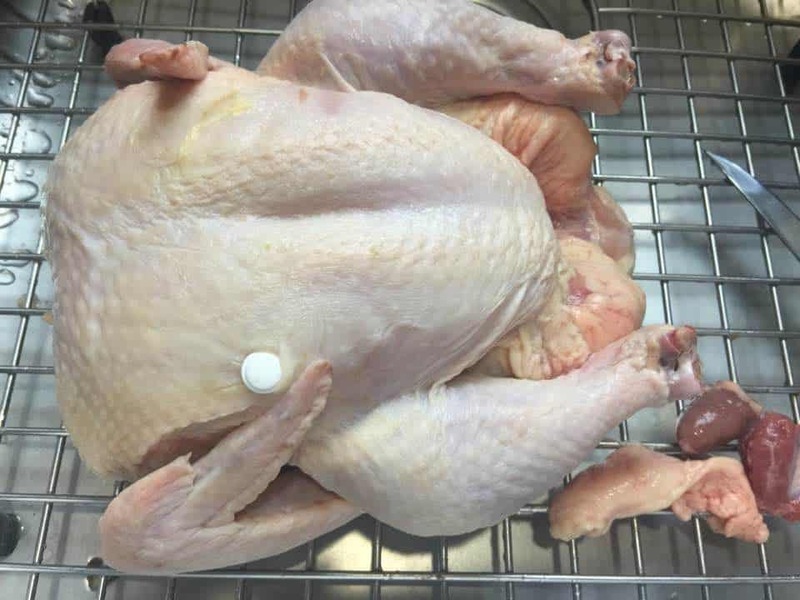 Note: Eating raw chicken is dangerous, please use a meat thermometer for making sure your internal temperature of the chicken is 165 degrees F.